So you’ve caught the de-clutter bug and you’re slashing your way through cupboards, corners, shelves, nooks and crannies. And while you can see big inroads with your work, you also realize that on your journey to organization and simplicity you have generated a lot of chaos, which wasn’t really the vision. When this happens, people quickly turn to storage systems to combat the disorder, and swiftly things begin to look neat and organized again. Peace prevails, sanity is restored. Storage solutions can be as simple as a utensil rack in the kitchen or extra shelves in the linen cupboard and whole industries have been built around creating effective wardrobes that utilize every last centimeter of space. It can be a series of storage boxes, vacuum pack systems, racks, etc. I find when I am flicking through storage catalogues or wandering through a shop specializing in storage solutions that I am like a kid in a candy-store. All these options and ideas to conquer disorganization and chaos! The problem is that we often use such storage solutions to move clutter from one place in the house to another storing it attractively but haven’t actually addressed the underlying problem ……………….. too much unnecessary stuff! Remember, organized clutter is still clutter. My friend gleefully bought two handbag holders that hung from a coat hanger in the wardrobe, each held 7 handbags. Handbags aren’t my weakness but I am in no position to criticize as I have my own “vices” on the collection front. However the obvious question was……who needs 14 handbags? – and this wasn’t all of her handbags either, these were just the ones that were bought to match particular outfits. Just for fun we tagged them, to see how often they were used and a year later she realized that she didn’t even have most of the outfits that she bought them for anymore. So they all ended up auctioned on trademe (NZ version of ebay) along with the holder and the proceeds went to buying something else. I was determined to buy a trolley designed to hold extra paraphernalia in the bathroom as the vanity cupboards were overflowing. I had measured the space available and carefully selected the model from the catalogue and was eager to do the purchasing when it occurred to me that it was an area I hadn’t actually de-cluttered. Suffice to say, by the time I removed the empty bottles, the expired medicines, the hair clippers that didn’t work, all the cleaning agents that had been shoved in there instead of being returned to the laundry shelves and realized that there were enough full bottles of shampoo and conditioner in there to last us months – we actually had plenty of room and didn’t need the extra storage trolley. I have two friends who bought those vacuum seal bags that you store clothes or blankets in. A great idea.. Ironically the friend that lived in the warm North had more blankets and duvets (doonas) than the one who lived close to the mountains. So she decided to re-evaluate what she actually required and eventually donated a large number of blankets and quilts to the Christchurch Earthquake Disaster relief effort last year. However, the friend with the few blankets was attempting to store mostly clothes – and all from bygone eras and sizes. She got caught out when she asked the other friend for the now excess vacuum pack bags. She wrote out a stock take and quickly realized she wouldn’t wear the clothes even if she did get back down to those sizes. The final outcome was neither ended up needing any of the vacuum pack bags. But that’s not to say, someone with very little or no storage space, and living in a climate with extremes in temperature wouldn’t utilize them well. So how do we know when we have crossed the line from a storage solution to attractively stored clutter? Only you can decide that. Don’t be surprised if a storage system that was going to be the answer to all your problems, is leaving the household a year later. Sometimes we just aren’t ready to let go of a particular area of our life and home, but as we peel back the layers of clutter elsewhere our ‘protected’ clutter begins to become more obvious to the eye and less necessary to us. Ask yourself, can I delay purchasing this storage solution for a month? If so, will I still need it? Am I simply trying to contain something that I just don’t want to sort out yet? Do I want to admit that I have too many whatever-it-may-be ? Am I just trying to make a quick fix in a tsunami of clutter I have unleashed on myself? If I revisited this collection of stuff over several weekends, would I be able to get rid of more stuff each time? Is its replacement worth more than the storage item would cost? If the storage solution deals with, say, a laundry cupboard that has never had enough shelves, go for it. But if it is to support something that you just haven’t dealt with or is something you have an unnecessary emotional attachment to….then you probably should save your money, and work thru the issue separately. I’m not telling you throw out precious items, or to leave valuable items unprotected rather than give them the storage they need. Only you can decide what your priorities are in your home. But a good indicator is that if your best friends tell you that you have way too many shoes, don’t buy an extra shoe rack. Or if you don’t actually know what is in those twenty storage cartons, don’t invest in that attic access ladder. So my friends, I leave this in your hands to discuss. I am merely someone who is on the same journey as you are on, and this is only my opinion. I am open to other perspectives, or to answer questions. And if anyone in NZ would like a shoe holder that clips onto a wardrobe door…..mine has outlived its usefulness, and is free to a good home! Return something that you have borrowed from someone else that you should possibly have returned some time ago. I so understand where Moni is coming from when she says… “I find when I am flicking thru storage catalogues or wandering thru a shop specializing in storage solutions that I am like a kid in a candy-store.” … I love storage solutions too. But without the clutter I don’t need the solutions. Now that I have less craft clutter I don’t need this set of storage bins to organise it in. It does take a little extra will power to let it go though. I agree. I once wanted a Züca (very fancy trolley) for my make up, then I decluttered and realized what I have… not enough to fill the whole thing! So, I saw what I had, en repurposed some things and now I have a very nice system that I actually use. I once bought a fancy makeup storage tray system for my bathroom vanity. It once was stuffed, but now I’ve reduced my makeup down to just a few essentials which in turn eliminated the need for the tray system – so I donated the whole thing except 1 skinny little tray that holds everything I need now. Moni, this is a great post. Thanks for being a guest poster while Colleen is having a great and very deserved vacation. I definitely frustrate my mother because I have decluttered so many storage items over the last couple of years. She wants to hang onto them because we might need them some day. Lately though, she is starting to realize that instead of using the storage containers we need to get rid of what we would be putting in them. She is starting to make the hard decisions. I think her philosophy was that as long as we had a way to store something she didn’t have to decide anything and it was always there just in case. At a few days shy of 84 she is realizing how much energy it takes to deal with all of the stuff she has been hanging onto. Last week we put 3 large storage containers in a friend’s yard sale. A year ago she would have never done that. I’m so proud of her. Thanks Deb J – good on your mother, better late than never. For me laundry baskets are a bit of a trap cause stuff is nicely contained and easily moved around and so I put stuff in them that I haven’t decided its final fate/destination or what needs a bit more sorting, and then it stays there…….and it breeds I’m sure. When my Grandpa hit 75 he told people to stop buying him presents because he had reached the time of life to give stuff away rather than gather it. He also started a major declutter about 2 years ago, going through old papers etc. It did mean that when he passed on last year (at 84) there was a lot less stuff / clutter for the family to go through. Such a relief for us in a time of grief. Oh Gail, smart grandpa you have there!! I recently decided to get rid of a very similar storage unit — IF I can declutter enough not to need it. You have inspired me BIG TIME. Hi Frances and welcome to 365 Less Things. 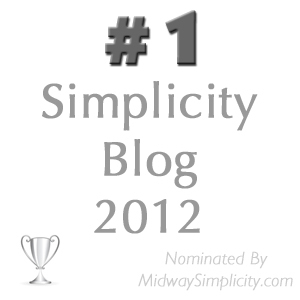 I am so glad that you have been inspired here at my blog. Between Cindy, myself and all the helpful comment from our readers there is always something to be learned every day. That was a very good storage system and it came in useful for me for a long time. It was used when I got it so now it has been released to be useful to someone else. I love items that stand the test of time and do what they are meant to do well. Moni, job well done with your guest post! I’ve lost count of the number of times when I’ve discovered that it’s so much simpler and easier to reduce the stuff rather than invent or purchase clever ways to arrange it. I also took a bag of stuff to the thrift store today and am on the prowl for more stuff to subtract from my life so that I can have more life in my life. If I’d wanted to be a curator I’d’ve joined a museum. Hi Grey Queen – I love free cycle – I can’t believe how quickly things get snapped up. Its gone and to someone who actually wants it. At the same time I was writing the post my daughter saw this freestanding full length mirror in a store brochure, and the mirror opened out like a door and behind it was set up to store earrings and jewellery. She decided that if she talked her dad into get it, she would probably end up in my post. So she got everything out to have a looksee and decided a good half were from her pre-teen years and too immature, so she cleaned them with meths and gifted them to her 8 year old cousin and everything fits back into her box. And her dad mounted a long mirror on the inside of her wardrobe door, so she’s feeling very pleased with herself. Just wait until she realises she made it into my post after all! How long have you been decluttering? 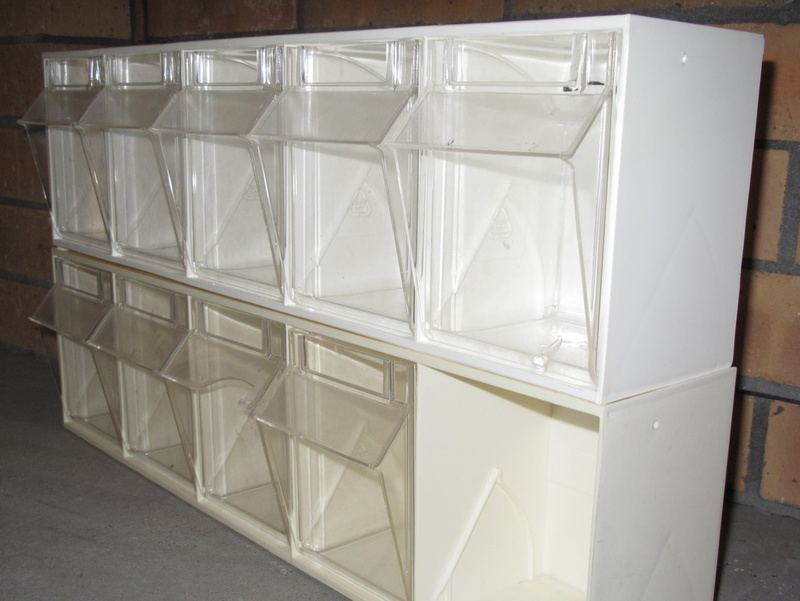 You sound like a veteran to be down to two little plastic storage crates. Hi Mona – I think I am a bit of a veteran – probably in more ways than one! I have been de-cluttering since 2009 when we thought we were going to sell the house after living here for over 30 years.And I am still decluttering ! We had what was probably an average amount of stuff for a family of five but I now think that even an average amount of stuff is way too much. I have to consider my husband’s feelings but if it was just up to me I would declutter much more radically . For example I would love to have just one set of crockery and one set of cutlery and use it for everyday as well as for entertaining. I actually love my everyday crockery and cutlery which I bought a few years ago and I could easily live without the formal stuff (wedding presents) but my husband is not quite in the same head space -yet… Icant believe how much stuff has already gone and yet there is always more -I’m not finished yet! It’s easy and enjoyable now but was harder in the beginning and a much slower process. You are doing very well Mona with your guest post and follow up comments ! Sorry Moni- how many times have I called you Mona ?? I ‘ve been reading an article about Mona Lisa and I think the name stuck! Hi again Judith – no drama, I get that alot. Also get Bonnie I guess cause it rhymes and they think “Moni? Must surely be Bonnie.” All good. Hi Judith – I don’t have formal crockery and cutlery – when we moved into our current house my sis-in-law who is a smart cookie suggested I go down to the local The Warehouse and I bought 10 each (I think) white plates, bowls & bread plate from their “Basics” line. As one gets broken as is inevitable with kids, I just waltz in and buy a replacement one. So easy! If you are a close friend of mine, expect a bbq (so the men cook) and paper plates (biodegrable sugar cane ones) that we throw in the outdoors fire and toast marshmellows over later in the evening. Why waste time slaving in the kitchen when you can be sharing a glass of wine with your friends? side note: most of our friends have at least 2-3 teens as well, so one of them gets picked to “do the dishes” which means they get to build the fire! Last night my hubby decided the set of 10 steak knives that we never use should go to Goodwill. Yay! They were a nuisance in my cutlery drawer. He is the son of two packrats borderline hoarders, but he loves me decluttering our house but doesn’t know how how to instigate a “cull” so this was great. Especially as he had bought the steak knives. Three years – wow you deserve a badge or something – I am officially on my 10th month, though prior to that I did an annual spring clean with a cull, however I realise now that I was only taking off the surface layer. I know- I’ve wondered the same thing !!! But haven’t run out yet !Taxi truck has just arrived to take 5 huge Ficus pots to my step-daughter’s . I think you never stop de-cluttering. I probably started in earnest about 6 months before my wedding in 2007. Leaving a three bedroom house with a two car garage as a single person moving in with my new husband. He had accumulated stuff from his parent’s recent passing although he had moved into his home only two years prior. He had never actually decluttered before moving and had a lot of memories in boxes — photos, school papers, work product as a video producer, etc. Then we even put stuff in a storage unit. After another 18 months – tired of paying for the storage unit, moved everything into the garage and had to park on the street for another 12-18 months. Hubby offered to re-purpose some of my family furniture — one chair he made into a keepsake box. Now we can get both cars in the garage but a lot of his parent’s stuff is still “in a box” — about 20 of them. Hi Eileen – if you don’t mind me homing in on the topic – because I know it is one that I will have to face at sometime in the future (lets just say my parents and inlaws each have a lot of stuff and no plans to declutter). It is 5 years since your inlaws passed at least – and their stuff is still in a box. Obviously it is your husbands stuff now and there will be grief attached to it. Can I ask what you think is holding him up from opening it and sorting it? Time? Grief? Overwhelmed? Great post, Moni! I understand the kid in a candy store mentality when it comes to storage containers. I just can’t go into Michael’s photo storage section because I think I need to buy one of everything. What I really need is to organize the photos and use the boxes I already own. Hi Willow – thanks – one of my upcoming projects is to organise our photos – I had most of them digitised from the negatives two years ago and put them onto the external hard-drive – I have gone no further with the originals though – what is your master plan? Since I have 100 years of photos from great/grandparents and parents as well as my own, I need a better plan than I have now. Currently, during school breaks, I scan groups of photos. The big question is ‘what do I do with the old photos?’ Right now they’re back in the boxes although they have been culled and organized. Originally, I had planned to make albums for each of my four children, but now I’m considering only giving them the cds when I’ve finished scanning. The rest of the master plan? hmmm, still working on that. Hi Willow – that is a lot of history in those photos. Yes you are right your children would probably prefer a digital set, but it leaves you with the actual copies – and I can fully appreciate that you can’t just chuck them out, its pretty special to hold something that your great grandparent would have held. Perhaps ask your children if one of them would like to inherit the family photos – especially the old ones. Or put the historic ones into a special album with names, dates etc written. I had a friend who had to clear out her parents house after they passed away, and there were boxes of old photos and she had no idea who any of the people were. Fortunately for me, I don’t have too many past generations photos, most immigrated here to NZ and could bring very little with them, but we have hundreds of photos especially of our kids, so a bit of a dilemna as to what to do with those. I think people born during the digital age who will probably never print out a photo are at such an advantage. Or maybe a local library or museum would like some of the photos, particularly if they are of a street or building nearby like the local school in 1902 or church where your parents got married in 1964, a soldier going to war, that type of thing. I like the idea of taking all of the older photos and putting them in an album. I like the albums that have a small section to the side where you can write in some information. It could be a project you do over time as you sit and watch TV or something like that. You could continue with one about your family. Someone in each generation could become the keeper of the family history albums. I sure wish we had something like that. I’d much rather have that than the big book we have of name after name of our geneology with no pictures and nothing much about each person. I sent them to a photo lab to be done, not long after that I saw in an advert that there are negative readers new to the market. Was a bit bummed cause obviously I could have done it cheaper and could have been more discerning over what photos we had digitised. I was on a time limit as we were doing a digital picture frame for my inlaw’s 40th and I was offered a reasonable bulk rate by the photo lab on a per roll basis, plus they were back within 3-4 days. The advantage of owning the scanner is that they scan straight to your hardrive. Mine arrived back on disk. Now I have the photos, the negatives, the disks and the ones on the hardrive. It didn’t occur to me to ask if there was a flashdrive option. Like I said I was in a hurry at the time. On the other hand it would have taken me a long time to digitise all our negatives, allow a couple of minutes per photo I imagine, and quite possibly I would have lost enthusiasm or been sidetracked with other stuff. I am glad thought that we have them on hard-drive, I know someone who lost all their photos in a house fire and that is what they miss the most. Cool thanks for that will look into getting a lend of a neg scanner and I’ll just have to be patient and work through it. Great post. People make a lot of money helping other people organize their clutter and hide it instead of dealing with it and getting rid of stuff. Closet organizers or storage containers have their place, if used wisely, but many times they aren’t. Hi Spendwisemom, I agree – ironically when you see the storage systems in the catalgues everything is so minimalist and spaced out, its almost like they never even needed to declutter or require a storage system in the first place. I liked your post very much. Thanks for bringing the topic up again. As you mentioned going for storage solutions where needed: I came to “shopping my home” for these occasions. If I really need a container to – say hold spices or similar, I just look around the apartment and usually I can find a suitable container holding declutter-worthy stuff, so I just declutter e.g. in the office and get some solution for the kitchen that way. If I can’t find something quickly, I often settle for cardboard boxes (shoe boxes, chocolate boxes,… ) nowadays. They are used as drawer dividers, as storage boxes in a shelf and in other possible ways I can think of. I do this, as I realized that storage solutions just turn up in the house like any other clutter as well, like the perfectly good basket I got potted flowers in for my birthday, – or either the place where the solution is needed or another storage container is freed of clutter within a few weeks or months anyway. Hi Sanna – I recently had a big clear out and re-organise of my hall cupboards and had the same idea to use shoe boxes to store/seperate items, it was sort of a lightbulb moment that to buy a specific container would probably cost more than the items it would be holding. And I was able to write on the ends of them what was in each so I can find them easily. The best part is that when a shoe box becomes surplus to requirement in my ‘system’ it isn’t a big deal to throw it out and don’t have to find a new use or new owner for it. I definately agree that “storage solutions” are apt to present themselves among the general household throng. I’m a big fan of shoeboxes; hardy any of mine have shoes in them, but they store an array of smallish things, grouped by type, on a shelf in an incredibly small cupboard. They’re labelled things like; Paintbrushes, Gluegun & Adhesives, Travel Stuff, Electrical Stuff etc etc. These are small things which would otherwise wander all over and things which some people would otherwise have in a kitchen junk drawer (and I haven’t one to spare for that as only have one drawer and have my flatware in that). Shoeboxes are great as they’re available for free, can be recycled when you’ve finished with them, and some of them are rather attractive. I can out my hands on anything in my Shoebox Storage Selection in seconds which is great as if I have to spend too much time pawing around to find tools and supplies, I get fractious and may even wander off and do something else. shoe boxes are my mothers weakness. everytime we are in a shoe store she asks for pretty shoe boxes… this way we have a huge collection of shoe boxes for all sorts of things. She is a kindergardener so all sorts of craft supplies, dolls, paper, brushes, pearls and so on are all stored in show boxes. and just when I think about it, I dont own any show box anymore. I have other boxes that I use for all sorts of knick knacks…. But I always keep a spare one, if I need a box for a parcel or a storage thing in emergency. I was given a piece of furniture to use like a dresser in my bathroom. It has two drawers and then a doored area with two shelves. I was going to paint the piece white so in the process took off the doors and left them off. I had thought about using baskets to make more drawers. But the price of baskets is outragous and I would have had to then paint them. So I am picking up boxes to cover with sticky paper instead. I like them even better than the baskets. Less effort to keep them clean. I think this is a great post and one we can all learn from. However, I’d like to suggest that storage containers can be very useful when you start the decluttering journey. For instance, taking everything out of the junk drawer and organising it nicely into a storage container helps start decluttering and tidying while the cute container can be the motivation to take this first step. A year later, further down the declutter road, you may realise you never use those “very useful items” in the junk drawer and they can all leave the house. But without that container maybe the step is just too big. 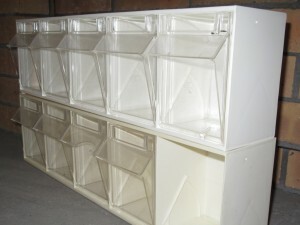 Hi Gail – yes I agree, my early decluttering did involve a lot of click-clack plastic containers (which have since become school lunch boxes) and stackable storage bins (which recently were put back into active duty for the Great Garage Clean Out labelled “Goodwill” “Recycling” “Hand Me Down” “eBay”). When I began decluttering, I would have never believed the list of things that eventually got the heave-ho. Or that this project would have gone beyond a spring clean that got out of control. 🙂 I wrote this post with the more seasoned declutters in mind but yes anything that motivates someone to start down the path is worth it. Great post today, Moni. It’s really struck a chord with me. I LOVE storage containers!!! I find great delight in solving a storage problem by creating free ‘something from nothing’ solutions e.g. shoe boxes, cut up milk bottles, icecream containers (2ltr and 4ltr). I’m in my element. Sometimes I even decorate cardboard boxes with pretty paper torn out of magazines (a bit like paper mache). It’s amazing what you can do!!! As if my decluttering isn’t enough, I’ve decided to have a go at making my own yoghurt, so….yes, you guessed it…I need to save GLASS containers now. Will it never end…. By the way, I have spent an awful lot of time cleaning up empty plastic food containers, too. I do mosaics as a hobby so I do need them, but, certainly NOT the number I have been known to keep. I’m starting to see reason and not accumulate so many, but it’s a daily struggle. I guess I just like being orgainised in my funny little way. On a brighter note, here in Australia, there is a movement called ‘Homeless Connect’ which is having a drive for donated toiletries culminating May. So, today I took loads of shave cream, little soaps, face balm, washers, deodorants and the like to the drop-off point….feeling very good! Hi Sue D – my husband has this story where I had a big pile of stuff that was going off to recycling and goodwill and to be handed down (stuff that he thought was too good to be just gotten rid of) and he saw some empty grocery boxes on the table and he offered to break them down for me and I was like “no no leave those, they’re invaluable” (not understanding I was using them as sorting bins). He now understands how I work but at the time he thought I had gone a bit loopy. Sue D, this. absolutely. organizing things has been always a task I loved to do. it feels itchy if I cant sort out things that need to be sorted, like magazines, paper bills, books, CDs, etc. I remember offering myself to a friend to sort out her account statements (? ), because she just had them flying around… my teacher called it the “little neuroses one has to cultivate”… I always had that and with decluttering I get even to do this more often. I am going to my friend’s next week to help her with all the paper she has in bags sitting around her house. We are going to sort through it all so we can organize what needs to be kept and shred what doesn’t. Then we are going to create an organization system so that she knows how to keep on top of it all. I was addicted to storage solutions, boxes, tins …. all that stuff once. While decluttering I realized I had boxes stored within other boxes. Crazy, right? But it is not always easy to stick to the “no more containers” rule. Right now I had to buy another bathroom wall storage thing to appease the just moved in boyfriend because he was screaming that there is no space for his stuff. 6 weeks and some using up (many doubles of course) later the new storage is almost empty … The storage is okay. We can move things there that now reside somewhere else and actually could be in the bathroom as well. But I hope this experience will burn the message into his brain, to declutter first and buy second, especially when it comes to storage. Lena, reading your comment brought up an idea here again. I’d love to see everyone’s home once – or at least some of the cupboards and drawers we all keep on talking about. I could imagine one reader showing her “weak spots” or the things she is particularly proud of (decluttered kitchen cabinet or whatever) in a post – or a themed post like “kitchen” – for which each reader can send in some pictures of her kitchen problems or smart solutions in the kitchen. I don’t know whether you would be up for it, but I’d love that. Sanna, I wont be able to take pictures for my bathroom problem, as I just rearranged 10 minutes, decided on a “get yourself together and use those things up” round. they are now standing right next to my sink. I will hate them so much standing there that I could actually manage to get them out as soon as possible. Haahahaha be careful what you ask for, If I posted what my house looks like at comp time you would all run screaming to the nearest empty room!!! When it’s not comp time I have that (almost) empty room heehee!!! I would love to see all the spaces, befores and afters! I just love looking at the blogs of people that were once over stuffed and they have taken pictures before and after the cull. Makes me realise that we all live life and life sometimes is very full without us really seeing How Full!!! I can appreciate exactly what your house looks like at comp time. At one point I had two daughters competing, the lounge floor would be covered in tutu carriers, a clothing rack with costume bags, boxes, suitcases, portable cd player, wigs, sports bags, spare shoes, tool boxes, make up boxes. My older daughter retired from competitive dancing recently as she has a big year at school, and my younger daughter has decided to stick to “just” tap and modern for now, although she will probably scale it back to every second comp from next year and out the following year due to school committments. Fantastic post Moni. Years ago, a friend of mine moved because she didn’t have enough “away” as in enough places to put things away. That was long before my decluttering journey, but I wondered even then if she didn’t just need fewer things. As I said, though, that was years ago and she and her family love their house, neighborhood, neighbors, etc., so it turned out to be a good move. I know that she has at lease one hoarding parent or in-law, and she stays vigilant about accumulating too much stuff. After reading through all of this I am beginning to wonder if I really need the dresser in my bathroom. Before I got it, things were pretty crammed in the built-in part with the sink. BUT, I need to think about this and maybe I can use something much smaller. Thanks girls. You just gave me a wonderful idea. today is one of those days where this blog helped me solve a problem. my bathroom container is getting picked up tomorrow. I just needed to write about my problem to let me see the solution. I love moments like this. I love this blog. Have fun rearranging your bathroom! My mother is going to flip when I get rid of this piece of furniture but I have come up with a great way to take care of things and I’m so jazzed. I have been thinking about getting rid of several nicely decorated photo boxes because we don’t need them. I have a small foot and I realized that I can a separate pair of shoes in each one. I am going to take all of the non-daily use items out of one of the drawers in the vanity and use that drawer for my underwear and bras. The non-daily use items will do into a container I have that will fit on top of the pull-out bin that I have under the sink. By rearranging things just a tad and putting the boxes with shoes in the empty shelf in my closet I can get rid of that dresser. WooHoo! wooohoooo. your excitement is infectious. and I so know that feeling. They say summer is arriving today, finally. and we might get temperatures above 25°C, I am so thrilled. So I tooke the time and went through my wardrobe again. I lost so much weight, most of my summer things are faaaar to big now. I will try to find someone who owns a dryer, so I can dry them in there and they might shrink a bit. That way I could keep a couple of items and postpone shopping a bit more 😉 I feel so devilish clever… now where to find someone with a dryer, thats a totally different question. I’ll check my wardrobe again, too. It’s so strange: even though I way more or less the same as two years ago (max 1kg difference), some things are really tight at the moment. Don’t know why! However, I think, I could just get rid of those. Maybe they have always been rather tight and I just made myself think I fit in them?! I have too many clothes anyway. I love being able to get rid of clothes that are too big. The dryer idea might work for a short time. Since I hate shopping I used to put off getting rid of clothes until someone commented about them being way to big of something. Now I just let it go. I have so few clothes now but it’s okay. I’m finding that few people really notice. Deb J, I hear you. But some of those clothes are really new, only a couple of times worn and I really like them, so I dont want those items to go, just because I am too small for them 😉 I dont have a lot of clothes either, and I love it. the less I have the happier I am. Lena, my mother says I would make a good beach bum because I like loose clothing. The tighter clothes are that more I can’t wait to get out of them and into something more comfortable. I’m with you and not liking the feel of the material on my skin. Thank you for this post; I have been perplexed by people who blog about simplifying yet think nothing of going out and buying oodles of storage items to organize. It just astounds me and seems like another to buy, organize, move around, etc. This is a conversation my husband and I have had oodles of times. Our house doesn’t have a lot of storage space, but also has a lot of mess. He says if we just had more storage, our problems would be solved. I say, if we just have less stuff we won’t need as much storage. As I have been decluttering, I’m realising that actually we probably do have enough cupboards in the house, and some of my pretty, and not-so-pretty, storage solutions are sitting empty. I am a sucker for storage containers, too, but mine are usually those big cloth bags. I moved my sewing room last weekend and if you all read another of 365 less posts, I said I had a problem knowing what to do with the old popcorn tins. Well, since I loved them and they were empty, I sorted some x-stitch projects and emptied one of the cloth bags and put some of the items in a tin. (Some were decluttered to the trash). Then, I found a huge bag of the nylon loops used to make potholders and put those in another tin. Two bags gone. I wanted to keep the tins but may end up getting rid of them later but for now, the room is neater and I still get to enjoy my tins. By the way, the old sewing room was too messy to keep the door open but it looks so nice now, that even my husband is happy with the door open. It didn’t take nearly as long as I thought it would and wish I had done it sooner. Perhaps, I wasn’t ready sooner. Hi Maggie I am glad you found a use for the tins so you didn’t feel you needed to get rid of them since you like them so much. I am especially pleased that you found some things to declutter and have organised your sewing room so I looks nice. I bet you feel good about it. I am finally satisfied with my craft area also. Keep revisiting the same areas though because as you become more ruthless with your decluttering I am sure you will find other things you are willing to part with. And the beat goes on. I have a green plastic bin that has held miscellaneous cross-stitch kits that I have not looked at in quite a while. I moved those to a drawer in the sewing room so I can find what I want and access them easily. Some I put in the give-away box if I knew it was something I would never finish. Then, I repurposed this bin – which the grandkids use as a bench – and put all my gift bags and tissue paper in it, tossing all the wrinkled and mashed items and getting rid of the paper bags of bags that originally held the gift bags. Also, took all my quilt projects – the partially completed ones – and put them in individual containers (those plastic sleeves curtains and blankets come in) and stored them together. Now when I want a project, I don’t have to spend half my sewing time looking for it. Trying to think where something might be keeps my brain spinning when I am trying to go to sleep at night. Now, I know where they all are and can get to them when I want. Hope you don’t mind my sharing all the bits of my decluttering. It’s nice to know there are others who are on my same journey. I love hearing about others successes and hope you enjoy mine. about 10 years ago and have kept it “just in case”. Also, several slings that I have used for my wrist and shoulder injuries. Think I will keep one of the slings – the best one – and donate the rest as well as the cast. I have osteoarthritis and my doctor thought I might have another foot injury and recommended I keep the cast. (It was pricey). But it has been over 10 years and no other injury so think it is time to pass it along. One more thing, I do love using shoe boxes for dividers in drawers. A little contact paper for color and when they get tattered, easily and cheaply replaced. Missing a part of my comment above. “Found a soft cast in the closet that I used when I broke my foot” – about 10 years ago.